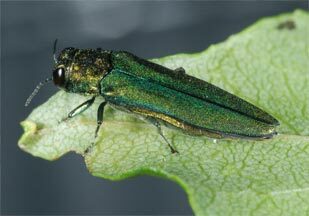 The Emerald Ash Borer (EAB) is an incredible beetle that was first discovered in the state of Michigan during the summer of 2002. The insect found its way to the United States from Asia in wood packaging components used for cargo transport. The adult beetles consume ash leaves and cause minimal destruction to the actual tree itself. The larvae, on the other hand, victimize the inner bark which restricts the tree’s capability to carry water and nutrients to the leaves. If you see these “D” shaped holes in your tree bark in the Wilmington Delaware area call (302) 475-7594 for immediate help. The beetle was seen in New Castle County in recent years. The beetles have been seen in firewood and, timber. Adult insects emerge in the spring and mate shortly after. Females can lay an impressive 60 to 90 eggs. In the planting season, pupae transform into full-grown beetles and emerge through “D”-shaped holes in the tree’s bark. Signs of an Emerald Ash Borers infestation may not be apparent right away because it takes three years for the tree to show signs of the infestation. Symptoms range from branch dieback in the higher crown, vertical bark splits, and epicormic branching on the trunk. Woodpecker damage is also common. Wilmington Delaware Authorities Have Been Screening for the Shiny Green Beetle Since 2004. Screening techniques involve visual evaluations and traps. Money From the United States Department of Agriculture has helped with monitoring and infestation outreach work. The department has been educating municipalities on the value of preparing and how to identify these invasive pests. Because of this education program Delaware’s parks and recreation now prohibits firewood from outside states. 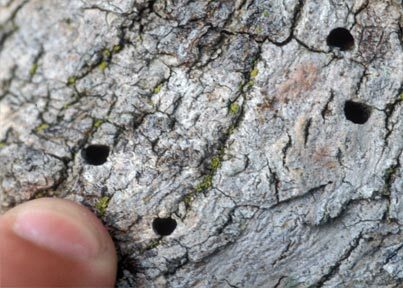 If you see tiny “D” shaped holes in your tree bark, contact Brandywine Tree and Shrub and schedule a visit. We’ll evaluate your tree and try to save it. Don’t wait, These Beetles Are Tree killers.